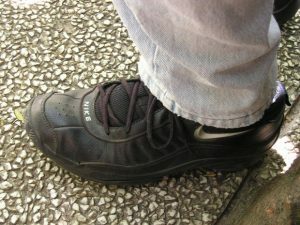 The warning against wearing “street” shoes on a gym floor is traditionally considered important because lots of shoes with leather and rubber soles can cause scuff marks on a gym floor. These steaks, usually black” can be hard to remove and are more likely to cause permanent stains the longer they stay on the floor. In a time when so many people wear footwear that would be considered athletic shoes, this warning takes on a much more complicated meaning. Much more shoe damage to gym floors is caused by grit picked up on shoes, regardless of the sole material, when the shoe is worn outside. Even a good dormat won’t completely remove this material since it can be easily compressed into the shoe bottom. When this happens, the grit doesn’t come into contact with the floor until someone jumps or skids, forcing the foreign matter to the surface. Shoes worn on quality gym floors need to be shoes that are never worn outside or away from the gym.